That’s better. 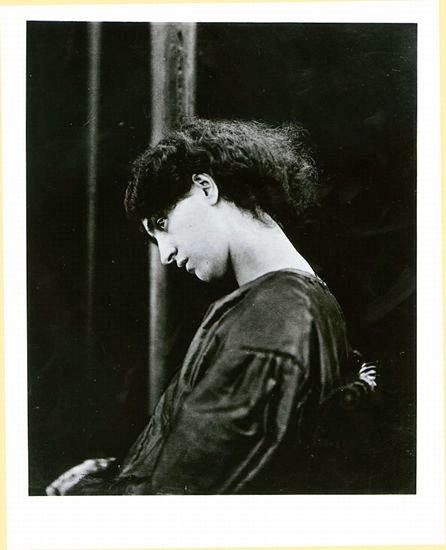 Anyway, it’s all very well and good writing about Fanny Cornforth, I have a fairly clear picture of her in my mind, but Jane Morris? Lordy, where to start...? When I came to write Jane, the thing I wanted to avoid was playing favourites to Fanny. Jane has always been a villain for me because she ‘stole’ Rossetti away from the woman who dedicated her life to him. Now, I know it isn’t that straightforward, but that is definitely how Fanny saw it. Jane had a husband and also had an ardent lover. That’s just greedy. Reading around Jane, certain things stand out. Her silence, her presence, and oddly, her kindness. It’s hard to level the brooding, punishing goddess of Astarte Syriaca with a woman who would welcome you into her home, but it seems that Jane was polite, kind and welcoming to people. She also was nobody’s fool, her letters make that very clear. But then again, how can that be the same woman who cause suffering to her husband through the foolish shenanigans of Kelmscott? It is impossible to think that Alexa would not have been told anything of Jane before she set off for Kelmscott in 1871, she knew Fanny for goodness sake. Also, Alexa would have noticed (if she didn’t know before) that Mrs Morris was there without the benefit of Mr Morris. I am happy to doubt whether or not Rossetti and Jane’s relationship was physical (hydrocele, ouch!) but they certainly had an emotional affair and that is bad enough. Alexa was there and would have had to tramp through the house every day to reach the studio. What did she notice? One thing I noticed when I was there last was that if Jane or Rossetti wished to liaise, one or other of them had to go through William’s bedroom to meet. Now that is horrific. So, putting pen to paper about Jane was damn near impossible to start with. I read and enjoyed The Wayward Muse by Elizabeth Hickey but that is very openly sympathetic to her, for obvious reasons. Just as Alexa threatened and pretty much ended Fanny’s reign as Queen Muse, then Rossetti’s obsession with Jane must have impacted on Alexa. Alexa was barely into her twenties when she went to Kelmscott and so I suspect she may have felt intimidated by the woman who had cast such a spell over her employer and friend. 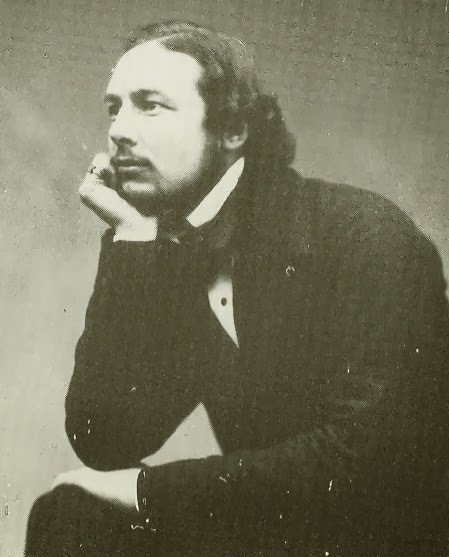 If Rossetti was mad then part of his madness was Jane, by which I mean the 'Jane' who existed on his canvas and the sly gossip of his friends. “I felt rooted to the spot, the girls rushing past me to greet their mother. She looked down at them and her mouth curved to a smile as she spoke, their eyes rapturously on her. 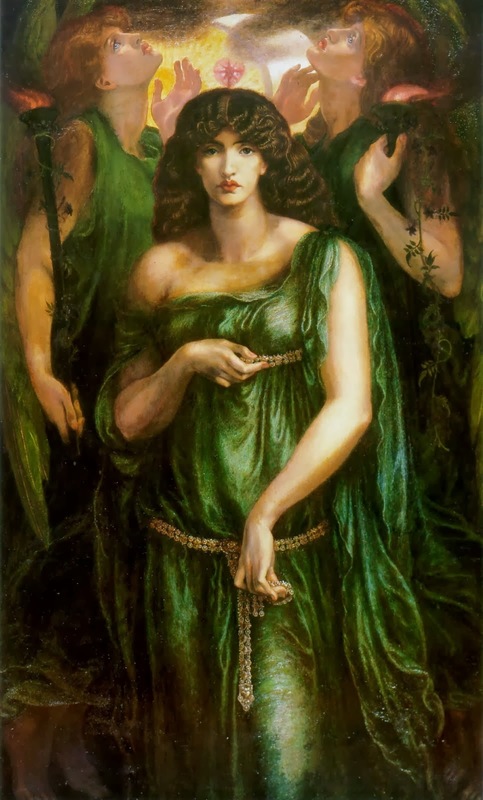 Rossetti’s eyes also gazed at her face, beguiled, ensnared, and utterly devoted. I looked at her and I felt afraid. The sky blackened, clouds that had scudded with summer breezes gathered, and the air in the garden thickened ominously. Her eyes once more rose to mine, causing my breath to hitch as I took her in. Both girls were pressed to her sides, her hands, such long, pale hands, resting on their shoulders in perfect balance. Her face, again such frightening symmetry, was dark, boldly struck with full lips, a straight nose and eyes fringed with lashes like coal dust. 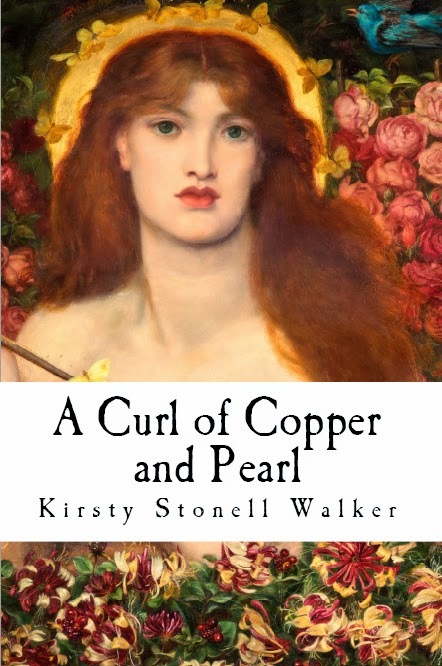 Her kinked, dark hair rose like a halo, a massive mane that tumbled and hung down her back. Her dress was a glowing jewel blue, and her tall frame carried the acres of fabric effortlessly, with no curve to ruin the flow of the fabric. We were just staring at each other, neither moving to join the other, until finally Rossetti waved me to his side, with a little impatience. ‘Janey, this is Alice Wilding,’ he announced, softly, warmly. She nodded and I tried to smile. Her eyes flicked from mine to the house. I was surprised at her concern, it sounded genuine and rather mundane, when I expected her lips to part and some message of truth to fall from them. Her voice too, deep and with the same faint burr of country I had heard in our driver, but covered with gentility, with a need to conform. ‘Thank you, yes.’ I rushed, sounding stupid and a little guilty at my frozen hostility. She nodded, appearing relieved. ‘Good.’ The word appeared, surprising me. As if there was a need for response, always a need for response to fill the shoes of the silence scattered in her wake. I wonder sometimes if Wm Morris and Jane had an understanding when they married that she didn't love him but he loved her and he wanted to provide for her and take care of her (very appropriate in a way) He was an honorable gentleman I think. What if Jane was just forthright and said - I will marry you, give you children BUT I don't love you and if I love others it's my business. maybe they had an unwritten agreement or something which would explain how they stayed together. Friends but not in love. I don't know but I have always felt the Morris was a kind, emotional person who had a bad temper but was generally kind. Just a thought. I was interested to read in a paper that Jan Marsh gave on Jane Burden Morris, that her father was taken to court for attacking someone. It's been my expericence that women dread that male anger, and William's outbursts possibly inhibited Jane from fully loving him, as the temper reminded her of an uhappy home, and made her shrink away from him, unable to open her heart. 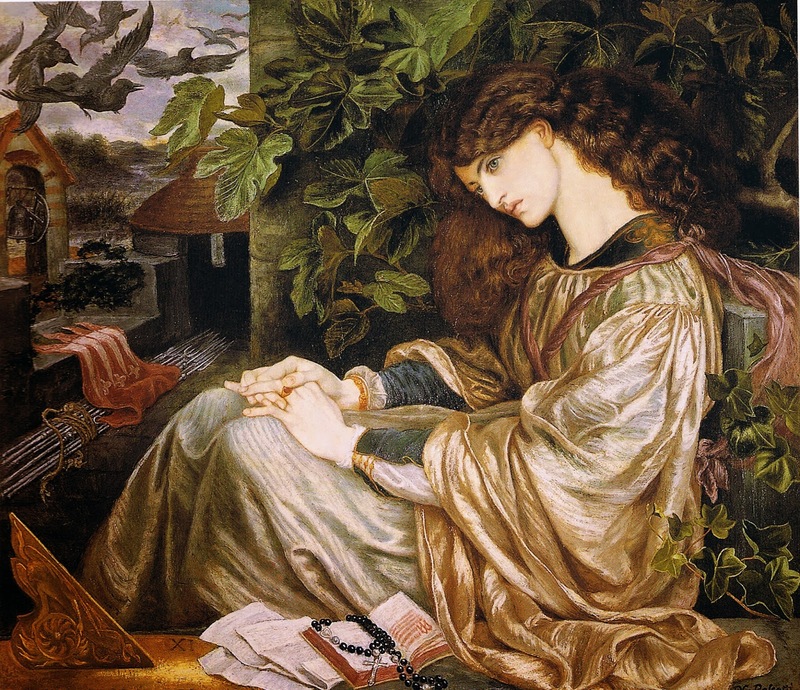 Although of course it's obvious that with the years she realised his bark was worse than his bite, and they had a closeness and affection, as seen in her nursing him, him writing (pretty much at the time of her closeness to Rossetti) how kind she was to him, and then when clarifying the title of the Queen Guinevere/Iseult painting of her by William, she referred to him in a letter to May as "the dear father". Thanks for your comments. I think the eternal struggle with Jane is that outwardly her silence and reserve do not make her a sympathetic figure but the more we understand or seek to understand her motives, the more we can relate, or at least should attempt to. I think the more we study the relationship between notable people of the past, the more we realize that life, relationships, people, were and still are infinitely more complex than they first appear.